Believe it or not, I had quite a challenge with "Preconceptions". I felt compelled to tell the story and issue the challenge but I had no earthly idea how to represent the subject in fabric. First to mind was perspective...I considered doing something a la M.C. Escher but quickly realized that was far beyond my current capabilities. I considered the process of preconceptions: formulating an idea, holding and building upon it and ultimately confronting its accuracy. My crystal ball doesn't work too well and consequently my preconceptions usually result in a stunning moment of enlightenment. It's not always pretty, as evidenced by the story that was the genesis of this challenge. But none of that helped me with my art piece. The more I thought about Preconceptions, the more frustrated and stressed I became. I read the other Viewpoints 9 artists' reactions and felt a modicum of relief, knowing it was challenging us all, but it was little consolation because I felt guilty and wondered if, somehow, I had pushed too far. Then again, isn't that the artist's journey? My inspiration finally came (VERY late) from a completely bizarre source: Goofy, the Disney Character. 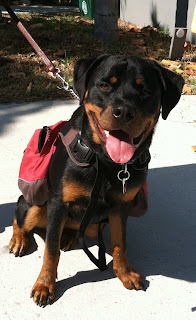 There is no accurate way to trace the fractals of my thoughts, but it led me to my dog: a Rottweiler. I have never loved an animal the way I love this dog; she is, for all intents and purposes, my daughter. But it wasn't always that way, not even close. I grew up with cats and was completely ignorant of different breeds of dogs and their reputations. When I met my husband he had just rescued a Rottweiler that was the most docile, sweet, inert animal that we affectionately nicknamed "Butterstick" because she was fat and laid around all day. A year after she died, we brought home another Rottweiler "Pink Girl" from a breeder and named her Ziva. I wanted "Purple Girl" because I'd watched and read Cesar Millan (the "Dog Whisperer") and he advised getting a medium energy dog. My husband insisted on the pick of the litter, a high energy, stubborn, know-it-all puppy. Shortly after coming home, Ziva challenged me. And challenged me, and challenged me. I believed she was a bad seed, the perfect example of why Rotties have a bad reputation. I was petrified she would act out against someone, including me. Every story I'd heard about Rottweilers (or German Shepherds, or Dobermans or any other maligned dog) came to mind. IRRESPECTIVE of the fact that I had owned and loved another Rottweiler, I had a preconception that Ziva was not the dog for us. We went to training and I handled Ziva exclusively. We read books, consulted experts, learned all we could. In the process, I discovered a hilarious and accurate book called "Surviving Your Dog's Adolescence" by Carol Lea Benjamin. Who knew? I was dealing with a teenager!! Almost miraculously, on Ziva's first birthday, she suddenly understood and obeyed everything she had resisted before. Things I swore she never absorbed had imprinted on her like a baby duckling imprints on their mother. To this day, if I say "Ready?" to my husband, Ziva immediately sits beside me and looks in my face - just like we learned in puppy school and just like she ignored the entire time. The combination of my preconceptions, my early struggles and my subsequent victories, inspired me to create this piece. I still haven't determined what to name it; it encapsulates so much for me. But here is Ziva: docile, lover-girl that she has become, lounging on her bed and enjoying a dog's life. And, as my husband was quick to remind me, Cesar Millan had another saying: "You don't always get the dog you want, you get the dog you need." 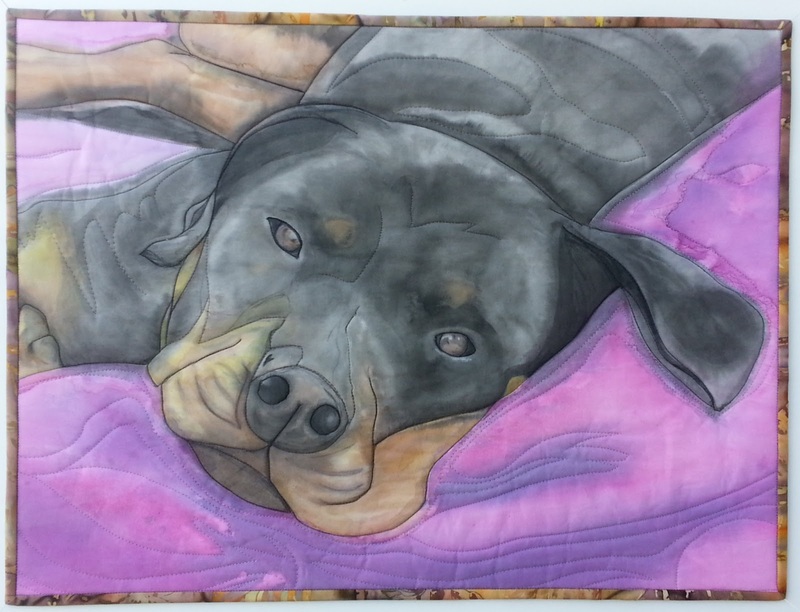 This wholecloth piece is handpainted with India Inks, Inktense pencils and a lot of love. Thank you Kate. I purposefully chose the softer colors for exactly the reason you mentioned. It wasn't until I had finished that I noticed they also echoed the pink-girl, purple-girl connection. That was totally subconscious! Ziva could be a goodwill ambassador for the breed :) even my family members who are totally cat people love her. What a wonderful portrait of a loved one you've created, Lisa-Marie! The dark and light on the face really capture the shiny coat. Beautiful! Love!! We have a GSD that scares the living pants off of everyone but is the sweetest dog imaginable. What a beautiful spirit you have captured. Absolutely beautiful! You've captured such a winsome and docile personality. I just want to reach out and pat her! Love (and miss) the Ziva! Looks so real, I thought Ziva was a computer print. You have mastered the technique so well Lisa-Marie. What a special pet in your life.